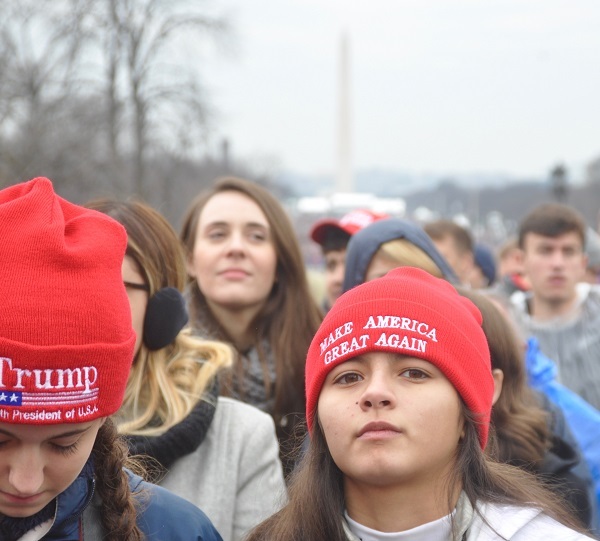 WASHINGTON (CN) – While the rest of the Supreme Court kept their views close to their robes, Justice Samuel Alito showed little esteem Wednesday for a Minnesota ban on political attire at the polls. Peppering the state’s attorney with several hypotheticals, Alito struggled to find consistency in why the law would force one voter to cover up a shirt with the text of the Second Amendment, but allow another to wear a shirt that read “Parkland Strong.” After the mass shooting earlier this month at Stoneman Douglas High School in South Florida, the latter slogan has taken off among proponents of gun control. One of Alito’s hypothetical voters wore a rainbow flag shirt, while another sported a Colin Kaepernick jersey, and a third donned an “All Lives Matter” shirt. The justice voiced frustration at this morning’s hearing as Daniel Rogan, an assistant attorney for Minnesota’s Hennepin County, gave each of the imagined voters different odds at successfully casting a ballot. The Minnesota law at issue prevents people from wearing “political badges, political buttons, or other political insignia” at their polling place, and the challenge to it comes from Andrew Cilek, the executive director of the Minnesota Voters Alliance. During the 2010 election, poll workers refused twice to let Cilek vote unless he covered up a “Please I.D. Me” button he had pinned to a T-shirt emblazoned with the words “Don’t Tread on Me” and the Gadsden Flag, the bright yellow banner with a coiled rattlesnake that Tea Party members adopted as a logo. Chief Justice John Roberts appeared to share Alito’s doubts about the ban, questioning whether it actually accomplishes Minnesota’s purpose. Representing Cilek and his group, Pacific Legal Foundation attorney David Breemer told the justices this morning that the law sweeps up entirely too much speech, creating a potential chilling effect that the state cannot justify solely because it has an interest in keeping polling places orderly. Breemer said the word “political” is used so broadly in the law that it could ban speech that only has a tangential relationship to an election and that could in no way intimidate or harass other voters. “This court has never upheld a prohibition on political speech as broad as this,” Breemer said. As for speech that could be intimidating or disruptive, Breemer said the state has other, more focused laws on which it could instead rely. The justices struggled, however, to pin Breemer down on where to draw the line for the government’s interest in preserving some decorum at poll sites. Breemer struggled to clearly answer some of the hypotheticals, leading Kagan to question how the court could ever find a workable standard to apply going forward. Hennepin County’s Rogan told the justices the law is a “reasonable and viewpoint-neutral” restriction that is necessary to preserve order in polling places and prevent confusion and intimidation among the voters. Calling polling places “a quintessential nonpublic forum,” Rogan said the state has more authority to restrict speech within them. Rogan also noted the law has been in place for a century, with Cilek’s being the only major challenge to it. He suggested that, going forward, the state can resolve issues on a case-by-case basis with voters whose poll-site attire draws the consternation of election judges.